In the twenty-first century, most people acknowledge the dominant role technology plays in our daily lives, especially in the ways in which we connect to others. The digital age brought forth the transition from hard copy and handwritten documents to electronic forms of communication and record keeping. In addition, social media networks enable us to broadly share personal announcements and to contact family, friends, and sometimes relative strangers with just a few clicks of the mouse. At times I find it difficult to imagine how I lived my life without the technological advancements of the past two decades. Yet, as a graduate student with a passion for nineteenth century history, I am reminded rather frequently of a life before even basic items such as ballpoint pens, mass-market spiral notebooks, and word processing systems. Strong participated in numerous civic activities which led to his prominence in New York City society. He served as a vestryman at Trinity Episcopal Church located in Lower Manhattan and a trustee at Columbia College (now Columbia University). 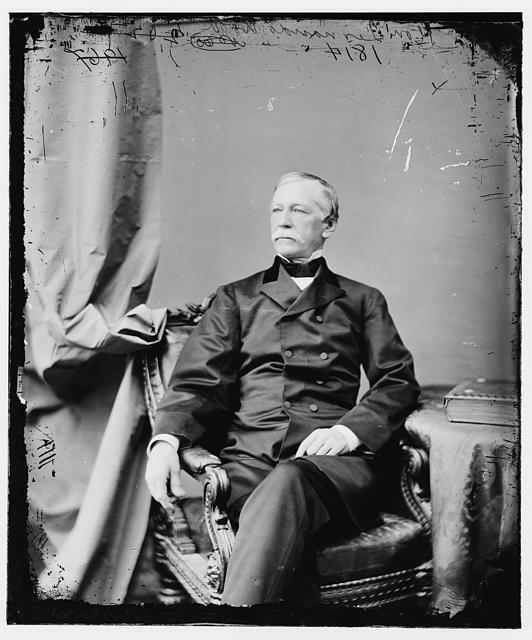 He also spent time as the Treasurer of the U.S. Sanitary Commission, which forced him to travel to Washington, DC multiple times during the American Civil War. Along with Frederick Law Olmsted, Henry Whitney Bellows, and Oliver Wolcott Gibbs, he founded the Union League Club of New York in February 1863. The Union League supported the Union war effort and donated funds to the U.S. Sanitary Commission during the Civil War. The brief background information above illustrates the busy and active life Strong lived. Despite his activities and commitments, Strong somehow found time to keep one of the most detailed diaries from his time period. Strong started his diary in 1835 while he attended Columbia College. He continued to write in the diary until June 25, 1875, one month before his death. His original diary consists of more than 2,250 pages and an estimated four million to four and a half million words. His words provide readers with the intricate details of life in nineteenth century New York City. Strong detailed his daily activities, social obligations, and political opinions. The diary supplies reflections on the events of the Civil War, including the New York City Draft Riots of July 1863, Robert E. Lee’s surrender at Appomattox Courthouse in April 1865, and the assassination of President Lincoln days later. First printing at Fales Library & Special Collections, New York University. Strong’s detailed forty-year account of his life in New York City during such turbulent times serves as an invaluable tool for scholars in a variety of fields. The history of the diary itself also reflects the power of the words within. The diary remained in the Strong family until 1927 when a descendant allowed the American Red Cross to borrow it. The diary remained protected by family members for privacy reasons and because the diary contains strong opinions from a tumultuous time in America’s history. The New-York Historical Society owns the original diary. Macmillan Company published the first printing of the four volume diary in 1952. 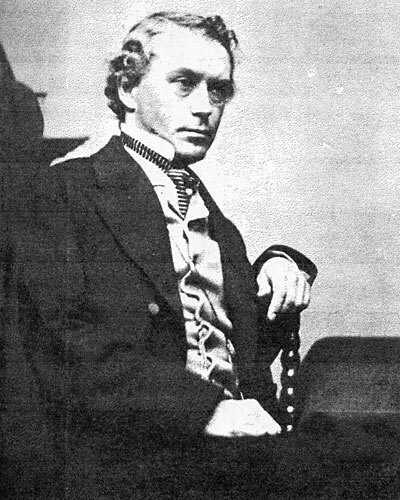 Allan Nevins, a historian, and Milton Hasley Thomas, a curator, edited the first printing of the diary. Reading Strong’s diary encouraged me to reflect on the ways he chronicled his life and how individuals document their lives today. In order to preserve his history, Strong had to sit down at a desk every night under candlelight and write using quill pens and then later gold pens. This process seems tedious compared to uploading a photo to Instagram or typing 140 characters in a tweet. Yet, without Strong’s diligence and time, scholars would lack an incredibly important artifact containing distinctive insights into the world of the nineteenth century. The ways in which we record our lives may have changed significantly since Strong wrote in his “minute hand”, but our thoughts and the moments we choose to remember remain the same. On Sunday, April 9, 1865 Strong wrote, “LEE AND HIS ARMY HAVE SURRENDED! Gloria in Excelcis Deo…” I think his exclamation would translate loud and clear in a tweet or Facebook status update today. For additional information on subjects discussed above, please visit the links below. Cadwalader, Wickersham & Taft LLP. During the American Civil War, New York City became an intensely volatile area. 1861 saw New York City as a patriotic place which sent troops to the front with much fan fare. By 1863, however, New Yorkers turned against the Union war effort. Politics and the devastation of war account for much of this civil unrest. In May of 1861, the 83rd New York Infantry marched down Broadway among hundreds of supporters shouting encouragement to the men of Greenwich Village who were going to preserve the Union. After such devastating engagements as 1st and 2nd Bull Run, Fredericksburg, and Chancellorsville the support for the war among those who waved flags in 1861 began to wane. New York City lost thousands of sons, brothers, husbands, and friends during the battles of 1861-1863. That the Union lost most battles during 1861-1863 did not instill confidence in the success of the North. Throughout the war the Mayor of New York, Fernando Wood was vehemently opposed to the war. As a Peace Democrat, Mayor Wood opposed the Lincoln Administration’s objective of bringing the South back into the Union through force. The dominant political party in New York City during the war was the Democratic Party, primarily the “Copperhead” faction of that party. Opponents to the Peace Democrats gave them the title of “Copperhead” because they wore copper badges to identify their opposition to the war. A more poignant image contained in the name, however, is that of a dangerous serpent. Republicans and War Democrats viewed Peace Democrats as dangers to the Union and New York City contained many of these dangerous opponents to the war effort. In New York City, Copperheads used racial prejudice and fear to turn New Yorkers against the war. They portrayed the war as a means to bring free blacks north to take away jobs from white New Yorkers. For those competing for low wage jobs, the prospect of this competition caused a vehement reaction against “Black Republicans” and their war. As support from home diminished, men in Union regiments from New York City began to feel the stresses resulting from this situation. Some, demoralized by Copperheads, decided to leave the Union army. 1863 saw a rise in desertions and by the end of the war 44,913 soldiers from the State of New York would be listed as deserted. 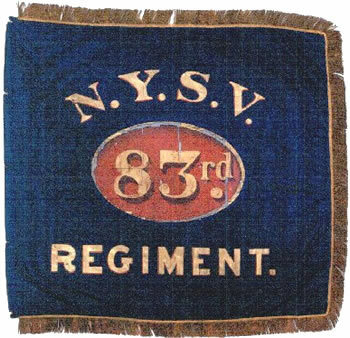 The 83rd New York Infantry Regiment saw about 300 instances of desertion. Some of these were “bounty jumpers” who were men that would travel from community to community collecting enlistment bonuses then deserting. Nine men who gave the name of “Smith” deserted within a month of enlistment in the 83rd New York. Others left because of demoralization or fear. Many desertions occurred in 1862-1863 showing that the unit from Greenwich Village was not immune to the effects of Union loses and Copperhead activity. The National Conscription Act and its enforcement in 1863 led to more volatility in New York City. For the most part, Irish immigrants viewed this act as a means of forcing working class white men to fight a war to bring competition for jobs to the city. The act also aggravated class differences in the city. Rich residents could purchase a substitute to serve in their stead. This policy, intended to raise some of the funds necessary to wage a war, infuriated the working class population of New York City. 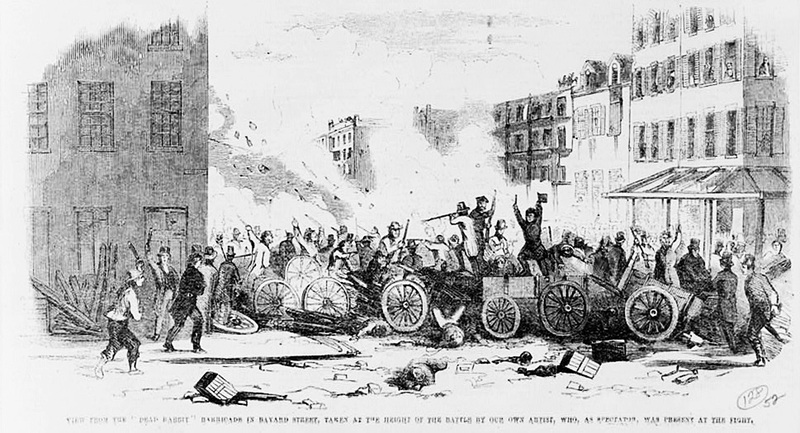 On July 11th 1863, the act was enforced and caused a riot more intense than any up to that point. The riots eventually caused over 100 deaths and much destruction of property. During the riots, Union troops fresh from the Gettysburg Battlefield, came to the city to suppress the rioters. Working-class New Yorkers, already against the war, saw troops in blue coming into their city armed to quell a rebellion. This helped turn more New Yorkers against the government of President Lincoln. In 1864, Copperheads planned an uprising in the city on Election Day. Hoping to help defeat the Union cause and Lincoln’s reelection bid, these confederate sympathizers tried to once again instigate New Yorkers to rebel against the Union Government. The plot failed, however, and New Yorkers seemed to ride out the rest of the war quietly. Citizens of New York City turned to the ballot box in 1864 to express their displeasure with the nation’s situation. President Lincoln received only 33% of the vote in New York City. The majority of men in the 83rd New York stayed loyal to the Union cause and were not swayed by Copperhead New Yorkers to leave the ranks or, for the most part, vote against the Union in 1864. They fought to preserve the Union despite discouragement from home. The men of the 83rd New York answered Lincoln’s call in 1861 and served faithfully until 1864. “83rd NY Infantry Regiment’s Battles and Casualties during the Civil War – NY Military Museum and Veterans Research Center.” New York Division of Military and Naval Affairs. Web. 02 Nov. 2011. <http://dmna.state.ny.us/historic/reghist/civil/infantry/83rdInf/83rdInfMain.htm&gt;. “A City Divided: New York and the Civil War.” Roy Rosenzweig Center for History and New Media. Web. 02 Nov. 2011. <http://chnm.gmu.edu/lostmuseum/lm/272/&gt;. “Abraham Lincoln and New York – Election Day, 1864.” Abraham Lincoln’s New York. Abraham Lincoln, Election & Politics. Web. 02 Nov. 2011. <http://www.mrlincolnandnewyork.org/inside.asp?ID=102&gt;. Lonn, Ella. Desertion during the Civil War. Gloucester, MA: P. Smith, 1966.